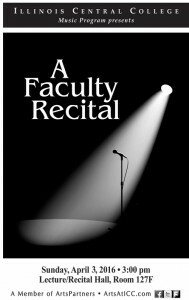 Faculty from the ICC Music Program will present a music recital Sunday, April 3 at 3 pm in Lecture/Recital Hall, Room 127F, on the East Peoria Campus. The program will include vocal and instrumental selections as performed by faculty members in the ICC Music Program. Selections range from works by Bach, Debussy, Puccini and Bernstein and feature pieces from Magnificat, La Boheme and Carmen. Those scheduled to perform during the recital include: Laurel Beard, soprano; Lyndsay Byers, soprano; Julie A. Clemens, soprano; Laurel Filzen Etzel, French horn; Libby Moore, soprano; Sherry Seckler, piano; Walter Stout, piano; Gillian Strachan, violin; and Grace Trang, piano.